Star Wars Land: Galaxy’s Edge is Opening in 2019! Opening at Disney World in about a year. Star Wars Land: Galaxy’s Edge will open in June 2019 at Disneyland Resort and in November 2019 at Walt Disney World Resort. Star Wars Land at Disney World is coming right along. Both Star Wars Lands will cover 14 acres. Disneyland’s Galaxy’s Edge is being built north of Frontierland, where Big Thunder Ranch was located. At Disney’s Hollywood Studios, Galaxy’s Edge is replacing the majority of the park’s Streets of America. A Star Wars-themed area will also be opening at Walt Disney Studios Park in Paris in 2020. We’ve seen the Star Wars Lands construction underway at both Disney World and Disneyland. They broke ground for both Lands on April 14, 2016. Really, really big construction projects. Construction at Disneyland required reconfiguring the routes for the Disneyland Railroad and Rivers of America. We were made aware of this during our last trip to Disneyland in summer 2017 when several attractions in Frontierland and Critter Country were closed because of Star Wars Land construction including the Disneyland Railroad, Mark Twain Riverboat, Sailing Ship Columbia, and Davy Crockett Explorer Canoes. The planet portrayed at Star Wars Land is called Batuu, which appears in the 2018 Star Wars: Thrawn Alliances book. Star Wars: At last year’s MNSSHP party with our Jedi Knights. We are all huge Star Wars fans! Meeting Darth Vadar is actually pretty scary! He’s 7 feet tall! Our brother Christian with Darth. Seeing Chewy at meet & greet. He is soooo tall too! At Mickey and Minnie’s Star Wars meet & greet. 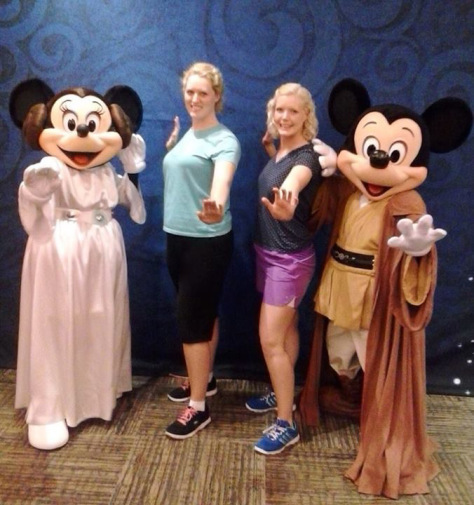 Feeling the Force with Jedi Mickey & Princess Leia Minnie. Caroline in her Taste the Dark Side t-shirt at DHS. 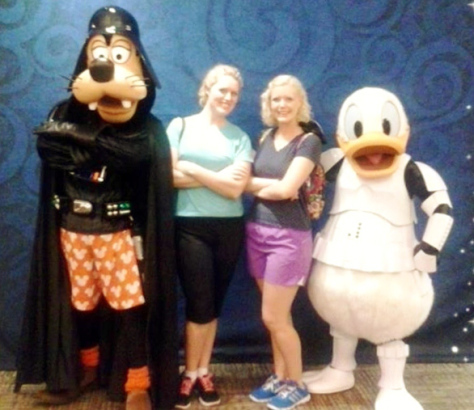 This entry was posted in Disney College Program and tagged Adventures in the Animal Kingdom, Caroline Collins disney blog, Darth Vadar, Disneyland, Elly Collins Disney blog, Galaxy's Edge, Star Wars Land, two disney sisters, two girls and a mouse tale, Walt Disney World, working at disney world, working at Disneyland.